Serve Coffee The Way It's Done At The Castle! 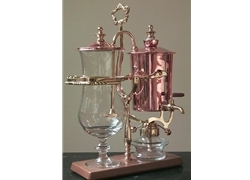 The Royal's patented Balancing Syphon Coffee System is at once the finest coffee making process and a work of art. The 'Glitterati' of the 1850's in Europe demanded not only the finest cuisine but also exquisite workmanship by artisans for even the most utilitarian of objects. Our artisans honor that legendary old world craftsmanship, down to the most minute details, like the rich brocade ornamental castings to the fine Lead Crystal coffee glass. This is an opportunity to create an atmosphere of elegance and distinction.